It’s been raining non-stop since I returned to Coca from Quito twelve hours ago. While it’s fair to say this is not particularly out of the ordinary in the rainforest, for me it’s fairly debilitating. The pounding of heavy droplets on corrugated metal means that I can neither understand anyone nor do any transcription. The storm has, for the moment, knocked out the TV and my internet connection. Worst of all, the rain means I can’t engage in my favourite form of procrastination: watching monkeys. My mother jokes that, now that our family dogs have grown more geriatric, all they do all day is sit at the window and watch “Squirrel TV.” The stray dogs of Coca seem to be similarly engaged in monkey-watching. Unlike squirrels, though, the monkeys that live down by the edge of the Rio Napo fight back, climbing one tree, sneaking down another, and attacking the dogs from behind. It’s a pretty entertaining interchange. Lest I give the impression that I think homo sapiens are somehow a higher order of mammal, I should note that the residents of Coca—including yours truly—are no harder to amuse. I must have spent a solid hour down at the waterfront this weekend observing people as they gave the monkeys various hilarious—if totally not-okay—treats, ranging from bubble gum to cigarettes. 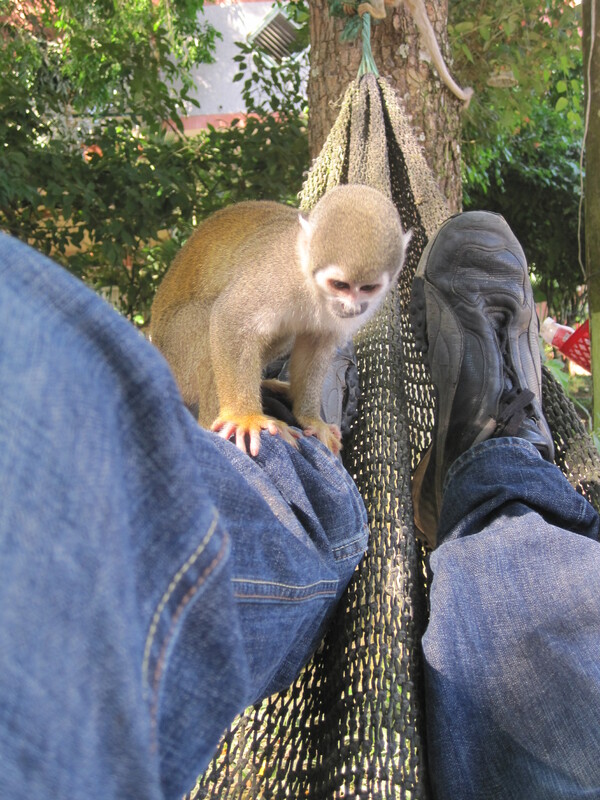 When I came back to the hotel, I sat outside trying to read… until a monkey came and started harassing me and trying to steal things from my backpack. I don’t quite know what it is—their almost-human faces or penchant for mischief—but I could watch monkeys all day long. 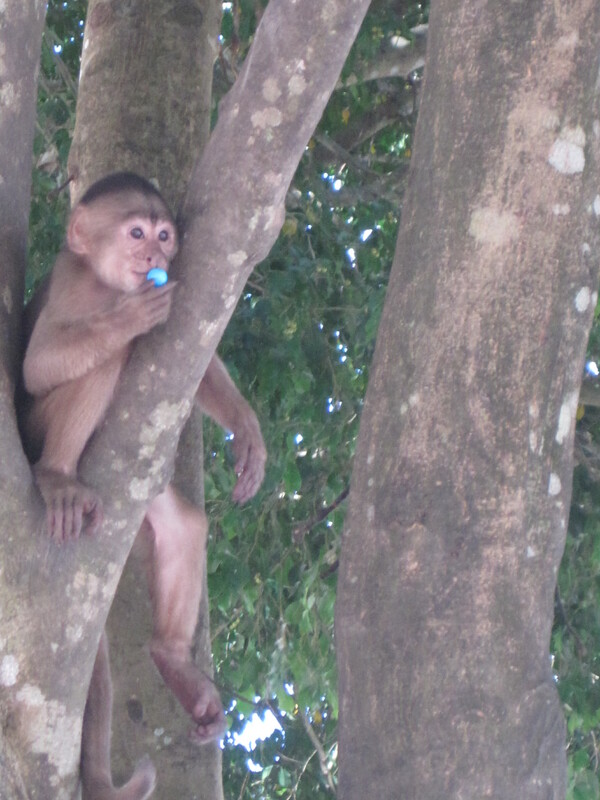 I feel kind of bad... but a monkey eating bubble gum is pretty damn cute. If you were expecting this post to have some redeeming pedagogical value, consider yourself officially disappointed. It’s been raining non-stop since I returned from Quito twelve hours ago. While it’s fair to say this is not particularly out of the ordinary in the rainforest, for me it’s fairly debilitating. The pounding of heavy droplets on corrugated metal means that I can neither understand anyone nor do any transcription. The storm has, for the moment, knocked out the TV and internet connection. And, worst of all, the rain means I can’t engage in my favourite form of procrastination: watching monkeys. But honestly, someone needs a “goddamn adorable” tag. Do your monkeys have blue balls? My monkeys have blue balls. Like the color of that bubble gum, pretty much. No, the monkeys here do not seem to have blue balls. Ecuadorian she-monkeys must put out. Well apparently Vervet she-monkeys only put out for he-monkeys with blue balls. Sexual selection catch-22!